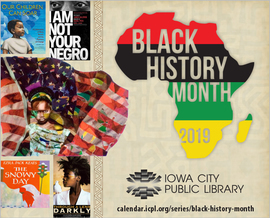 January 2019 | Visit us online at www.icpl.org. We're avid readers, listeners and viewers at the Iowa City Public library, and we know you are, too. We work very hard to create and maintain a quality collection for you to explore, use, and enjoy. That is why we bring you Shelf Talk, the email newsletter devoted to the Library’s collection of books, music, movies and more. Interested in our favorites? We love to share what we are reading, watching, and listening to on our Staff Picks page. There you’ll find our favorite titles, themed lists, and staff profiles. You’ll see my favorite 2018 reads there, including Sabahattin Ali’s Madonna in a Fur Coat, John Bacon’s The Great Halifax Explosion, and Madeline Miller’s Circe. Can’t find something you’re looking for in our collection? We want to know. We can try to borrow it from another library through interlibrary loan or purchase the item for our Library. 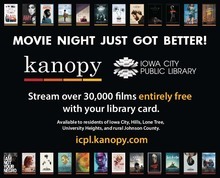 Enjoy a movie from ICPL without leaving your home! Kanopy is a streaming video service that has more than 30,000 films and counting, specializing in independent films, documentaries, classic and early films, international cinema, and educational videos. Users can stream up to 10 movies per month. Apps are available for iOS, Android, and Roku. As a user you can also create watchlists, share films on social media, embed clips in websites, make playlists, and comment or rate a film. Iowa City Public Library staff received a question via email in early November: What was the best book you read in 2018? The question may have been simple, but as any book lover will tell you, it doesn’t have a simple answer. The purpose of the email wasn’t to torture staff, but to repeat what the Library has done for years: compile a list of great reads published that year. 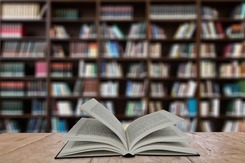 Everyone was asked to name a favorite book, or more, in 10 genres: fiction; young adult; children's – babies through second grade; children’s – third through sixth grades; romance; mysteries and thrillers; science fiction/fantasy; autobiography/biography/memoir; non-fiction; and graphic novels. The only rule was that the book had to be released in 2018. Any book that was nominated more than once made the Library’s Best of the Best for 2018 list. The book that received the most nominations would be named ICPL’s No. 1 recommended book for 2018. Michelle Obama’s memoir, Becoming, was easily ICPL’s most recommended book for 2018. It’s not often a book released so close to the end of the calendar year – Obama’s book was released on Nov. 13 – garners enough reads to achieve this milestone, but some staff nominated the book before they even finished reading it. “It’s that good,” one person said. In all, ICPL staff nominated more than 130 titles as their favorite books of 2018. Of this total, 27 made our Best of the Best list, including Vox by Christina Dalcher, The Kiss Quotient by Helen Hoang and Educated: A Memoir by Tara Westover. Find all of our 2018 Top Picks here. You'll find our picks for 2013 through 2017, too! In the TED Talk, The Danger of a Single Story, Chimamanda Ngozi Adichie, author of Americanah, explains that the understanding of our world becomes small if the stories we read come from the same place, from the same people, facing the same issues and problems. As Adichie says, “Stories matter. Many stories matter.” Fortunately, publishers are responding, expanding whose story reaches us readers. This February, take the time to seek out a variety of stories by reading these new memoirs. Emily Bernard’s acclaimed memoir, Black is the Body: Stories from My Grandmother’s Time, My Mother’s Time, and Mine, is a collection of personal essays on growing up in the South, getting an education at Yale, and teaching at a college in northern New England. The poetic memoir illustrates how her life was formed and framed through the lens of race. Trailblazer: A Pioneering Journalist’s Fight to Make the Media Look More like America documents Dorothy Butler Gilliam’s fifty years as a journalist and activist. As the first female black reporter for The Washington Post, she brought a different and important perspective on what was news and how it should be reported. There is a new edition of Pauli Murray’s Song in a Weary Throat. Originally published in 1987, Murray’s memoir encompasses the multitudes she contained. She was a poet, an academic, an ordained Episcopal priest, a Civil Rights activist, and a brilliant lawyer, influential in the pivotal Civil Rights cases of the 20th Century. Murray’s memoir shows that none of this was enough — a book that describes the discrimination she faced because of her race and gender.